← Fountain Hills School District Celebrates! Memorial Day will be celebrated this year at the Fountain Park Veteran Memorial. In addition to the service that is held at 9 am on Memorial Day, this year, there will be an extra salute to those American’s that have given the ultimate sacrifice for our Country. “Flags for the Fallen” will entail the placement of 50 full-size U.S. state flags near the Veterans Memorial. In addition, behind those state flags will be more than 2,300 small U.S. flags representing each of the fallen service men and women of Operation Enduring Freedom, which is the ongoing war in Afghanistan. The flags will be posted east of the Veterans Memorial early on Monday morning and will be present for the 9 a.m. Memorial Day service. Service member names and military information will be printed alongside their fallen fellow service members names on an A-frame sign placed besides their respective state flags. Each U.S. flag will be placed in rows behind the flag of the state in which the fallen military member was born. There also will be a side memorial to those who lost their lives on Sept. 11, 2001. The flags will be removed Monday at sunset after “Taps” is played in sequence by various trumpet or bugle players around the park. We look forward to seeing you on Memorial Day at 9am to remember those that have given the ultimate sacrifice for us. 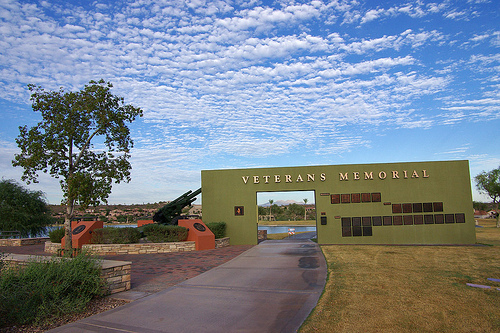 This entry was posted in Area Events, Clients, Customers, Friends & Family and tagged Flags For The Fallen, Fountain Hills Veteran's Memorial, Memorial Day, Memorial Service. Bookmark the permalink.